This minor planet was discovered November 1, 1905 by M. Wolf at Heidelberg. It was named in honor of Carl Happel (1820-1914), painter and great benefactor to the Heidelberg Observatory. From his financial support the Happel-Labor on the Knigstuhl was erected. With H = 9.2, this asteroid is probably 38 - 88 Km in diameter. Ten different sessions were conducted on this object, but only data from six nights were useful. 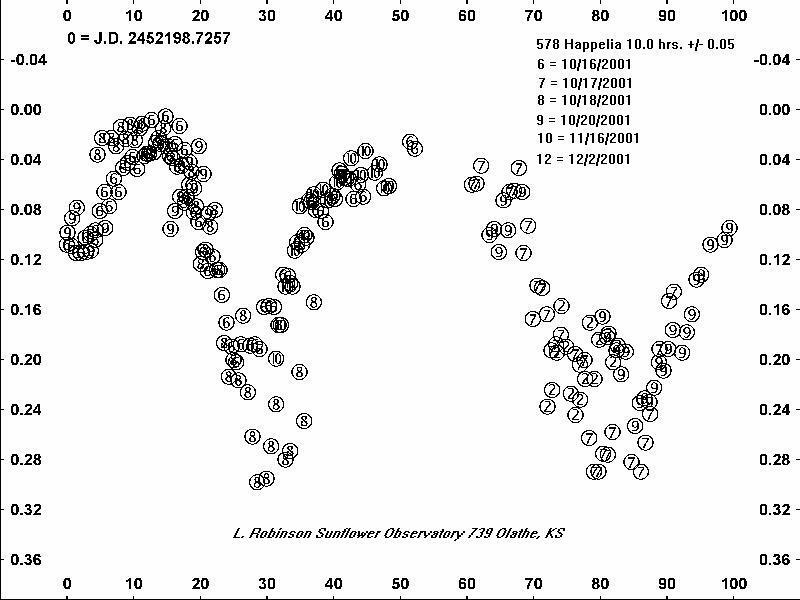 A total of 325 observations were acquired on October 16, 17, 18, 20, November 16, and December 2, 2001 yet still there was a significant gap in the light curve. The period of (578) Happelia was found to be 10.00h +/-0.05h and the amplitude 0.27m +/-0.02m.